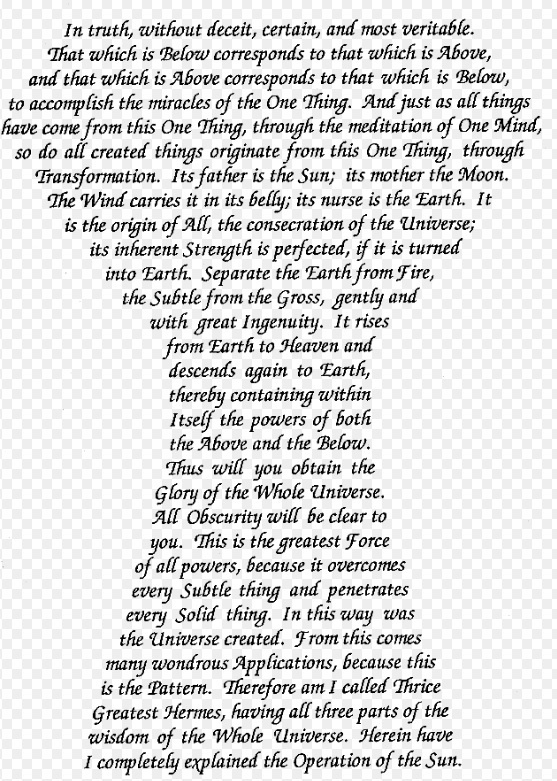 The image above is the English translation of the Emerald Tablet, laid out in the pattern of the holy grail. A grail, of course, is a chalice or cup while the holy grail was crafted by Christ himself. The Emerald Tablet is a historic artifact in the world of alchemy which has an extremely significant importance in the realm of the ethereal. Hidden on this tablet is the reveal of a unique and profound spiritual technology that is both complicated and difficult to explain, especially to the uninitiated. We will do our best, so bear with us. Despite the efforts of many to destroy and suppress the knowledge shared on the tablet, it has survived to this day. Keep in mind the English interpretation you read here is not definitive. There are many different interpretations and translations of the tablet, as happens with most artifacts of ancient language. Use the information as a guideline to influence what you believe, as opposed to a ruling or fact. What Is the Spiritual Technology? Encoded in the tablet’s message is a powerful formula that can be used to transcend all levels of reality simultaneously – including the physical, mental, and the spiritual. Ultimately, it shows us – humanity – how to achieve a powerful transformation within ourselves, and how to evolve. It is important to remember that the idea of alchemy is rooted in the spiritual domain, which is a level that many powerful alchemists wish to attain. If Nicolas Flamel indeed found the Philosopher’s Stone during his life on Earth and became immortal, then he would have encountered the hidden message from the Emerald Tablet, at least sometime during his journey. Few, if any know what this technology – and in essence the Emerald Tablet – truly contains. The goal is to one day understand the true message and achieve a level of attunement for our species that until then was unfathomable and unheard of.